Left Lancaster at 8:30 a.m., with a cooler full of bottled water, grapes, chewy bars, vanilla wafers and Adrenaline Rush energy drink by SoBe. Not until northern Virginia did the landscape look fully green and lush, like summer foliage ought to look. Then we realized how brown and dead Lancaster County is from this drought. I planned a drive in easy stages of six- or seven-hour days, with stops along the way to tour interesting spots. Our first day's visit was Petersburg Battlefield, below Richmond. Petersburg is unlike the Civil War fields I'm used to, being all a long scar of trenchs and earthen forts, built for siege warfare more reminiscent of World War I. We saw Fort Stedman and a number of other sites I had written about. But over 130 years, what were once deep gouges and high earthworks have eroded to ditches and mounds. There was a decent explainer program at the visitors' center, however, and I think Luke got the gist of it. We also drove out to the infamous Crater, among cedar trees and bluebirds and blistering heat. That, at least, still looks like something. It was the main goal of my Petersburg detour, because we lost family there. Josiah F. Passmore was my father's grandmother's brother, and he had gone in with a 9-month Lancaster County regiment in 1862, fought at Antietam and Chancellorsville. He was a bit older than average soldiers and had worked as a school teacher and in the quarries of Quarryville. He re-enlisted later in a heavy artillery regiment that was famously safe for doing guard duty around Washington. He probably re-upped for the bonuses, since he was newly married and trying to build a house. But his regiment got sent to the front in 1864, and was one of the first to charge into the hole that a regiment of coal miners had blasted in the rebel lines. They fought well, by all accounts, but a botched plan and bad leadership cost them the battle. He died there and we have sometimes visited his grave in an old hilltop church outside Quarryville. Luke, looking at the map, was disappointed that I would pass so close to something with an enticing name like "Great Dismal Swamp" and not make the detour to see it. We spent the first night in Emporia, Va., among the pitch-pine smell of southern Virginia, among Southern accents, among people who are warm and polite to you while giving you lousy service. We stayed in a Holiday Inn, which was the good, solid family place on the road (along with Howard Johnson's) in the 1960s when my parents drove the family back and forth to Florida every year. Now, they're showing their age. It actually would be very retro, with the chrome and the sixties colors, if you could keep it clean. Luke spent the evening in the pool. Sign of the day, evidently a malfunction on the electronic billboard in front of the McDonald's in Emporia: "Try our $1 men"
Crossing North Carolina on I-95 was made bearable by the game of being the first to spot the next South of the Border sign. We stopped at the Ground Zero of Tackiness long enough to pose for a few photos of ourselves with oversized concrete animal sculptures (above), and to buy junk. But even though it was lunchtime we passed up the chance to eat or even use the bathrooms. Back on the highway for the monotony of South Carolina pine forests, unrelieved even by "Pedro" signs or the occasional fetid paper mill. 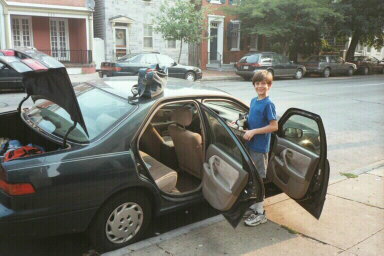 Luke read and I played tapes on the car stereo. Just before crossing the Savannah River into Georgia, we began to see real Spanish moss and real palm trees. Then Savannah itself, where we spent the second night. We arrived early enough to explore the city on foot. Everything was lovely; the little square parks, the restored riverfront. We saw spoonbills grubbing in a marsh and ate an excellent seafood dinner in The River Grill, then drove out past Fort Pulaski to Tybee Island, which is just 15 minutes from downtown and reminded me of one of the quainter Jersey seaside towns, but with palm trees and flights of pelicans lumbering past just above the waves. Luke says Kat and I should settle here. I agree. I said I'd ask her about it, and did so in an e-mail that night. Her reply: "Savannah is the kind of place that makes me want to be in dresses every day. ... Yes. Savannah would be fine. How could a girl argue with shade trees and sunshine, and that slow easy going life? I mean, isn't it just gorgeous?" Sign of the day (in spite of all the South of the Border candidates): "Triangle Waffle House. Jesus Christ is Lord." Just a long day of driving, with stop-and-go congestion all the way from Palm Beach through Miami. We took a lunchtime detour into Vero Beach to show Luke the kind of Florida towns where I used to spend summers. And there it all was again: blue ocean, warm and rough, with little fish swimming in the waves. We ate at a seaside restaurant that was way too expensive but I couldn't resist because it was done up in that kind of heavy, dark, wooden excess that I remember from my childhood Florida trips. What would you call that style? Tiki conquistador? It reminded me of every place my parents and grandparents went to eat. Spent the night at a Days Inn in Homestead, with Luke out at the pool till after dark, catching geckos and anoles. Finally, we're in southern Florida, and he is delighted. Got up early and drove an hour under hazy, bright skies to John Pennekamp state park, on Key Largo, and caught the 9 a.m. snorkeling cruise on the Sea Garden, out to White Banks reef. 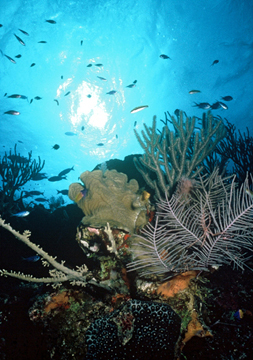 It's a cluster of brain coral and sea fans, thronged with brightly colored fish (parrot fish, yellowtails, angel fish, etc.) that sits about 5 miles offshore -- so far out you can barely see the shoreline, yet only 5 or 10 feet deep. Perfect for beginners, in other words. Luke had his first experience snorkeling in anything but a hotel pool. He swam among barracudas, which has to count for something in bragging rights in sixth grade in Quarryville, Pa. He kept calling this "the best day of my life." We changed back into street clothes and had an excellent lunch (sandwiches of grouper and yellowtail) on the southern end of Key Largo at Ballyhoo Seafood Grill, a converted 1930s conch house where they serve your drinks in glass Ball jars. I didn't realize that Key Largo was named for the movie, not the other way around. It was known as Rock Harbor, but John Huston came to the place and took a few atmospheric shots in the old Caribbean Club to establish a generic Keys setting for the movie he released in 1948. Bogie and Bacall never got closer than a Hollywood soundstage. But the good citizens, seeing the film's popularity, got the bright idea of rechristening the place, which they did in 1952. Whoring after tourist bucks, but the name was much improved by the change. We're on the Keys at last. Many of the mailboxes are held by plastic manatees or dolphins (Luke later spotted the place in Islamorada that sells them). Black cannons sit mounted in front of parks, or lie on the grass at roadside attractions. I read they're from the Spanish treasure fleets of 1715 and 1733, returning from the plunder of the New World, which were driven onto the reefs by hurricanes. In the Keys, unless you're on a boat, you live in a world of two dimensions, and only one road. Every location is defined in terms of the mile markers on A1A, from Mile Marker 0 at Fleming and Whitehead streets in Key West to about Mile Marker 106 on Key Largo, where the highway veers across Lake Surprise onto the mainland. And you're either on the bayside or the oceanside. Every bar anywhere in the world that affects a Hemingway or Keys theme (we ate in one in Marietta, Ga., on the homeward leg) has to have a green rectangular "Mile 0" marker on the wall somewhere. There are a few side streets of a block or two in the built-up places, and there are a few places where the road splits wide enough to allow a median. But on the whole, the world of the Keys is linear space. Our Conch Key address was MM 62, oceanside. The Ballyhoo was MM 98, median. 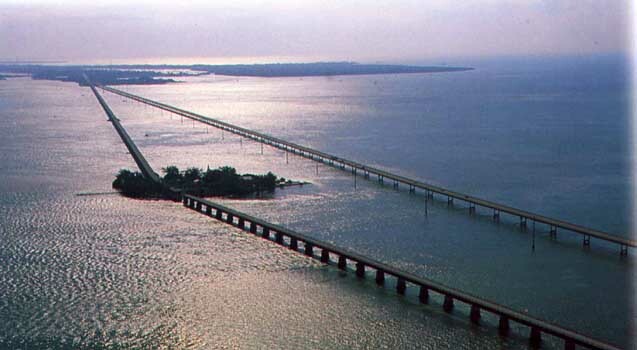 The islands are linked by bridges, originally built in the decade or so before World War I to carry Henry Flagler's railroad down to Key West. The 1935 hurricane wrecked the railroad, but the bridges soon were turned into a highway as part of a Depression WPA project, and in the 1980s new bridges were built beside the old ones, which were then turned into fishing piers or bike paths. After lunch, we drove on down to our place. Conch Keys are at the end of the second-longest bridge in the chain, Long Key Bridge, 2.25 miles over a carpet of ocean with more shades of blue than a Crayola factory. Off to the bay side is the original bridge, built in 1907: a series of stone arches that were so pretty the railroad company used it in its promotional photos. When the highway opened, the metal tracks were used as guard rails, and there they are still, rusting away. Our place feels like a cabin, though it's the end unit of three in one building. It's cozy and bright. The walls are painted yellow, blue, and purple, with pink and orange trim around the ceiling. Someone's bad oil paintings of Keys scenes hang on the walls. After dark, we drove up to the Green Turtle for dinner of cracked conch (me) and mahi-mahi (Luke) and Key lime pie for dessert. It's an old, wood-panelled, over-air-conditioned place with walls lined with glossies of celebrity has-beens. Luke woke before 7 a.m., wanting to go out and explore. I sent him back to sleep, but by 8 a.m. it's no use and we're both up. Drove south over Seven Mile Bridge (above) and spent the morning at Bahia Honda, which my guide book tells me is one of the few keys to have real beaches. The rest are mangrove swamps and coral rock. By mid-morning, after the tide had gone out and the seaweed cleared, we began to see why it's so highly regarded. It was a perfect morning for snorkelling. We drove back in the afternoon and Luke played in the pool while I drove into Marathon, the main big town in the middle Keys, for supplies. Things are expensive; gas was 20 cents per gallon higher than in Savannah. Things I had forgotten about southern Florida: sideways traffic signals, divided Route 1 and the challenge of making left turns on it. And the blinding light, reflected off the white surface of the gravel, which is made from old coral. I got one of the essential things for life down here: sunglasses with polarized lenses, to block out the UV and let you see below the surface of the water. And I bought them in the dark brown shades the fishermen prefer, to make the bright colors jump out. They're not just an accessory here; they're like magic. They transform the landscape and show you things in the clouds that you can't see otherwise. Then, when you come up over one of the high bridges -- Seven Mile or Long Key -- on the white and pale-gray roadway, with the sky all around, you're not earthbound anymore. You're in the cloud-world, with streaming sunlight or trailing curtains of rain over a sea like a mosaic of blue, green, silver, and purple. The land is just dark green flecks off in the distance, dark moles on the perfect shoulder of the world. 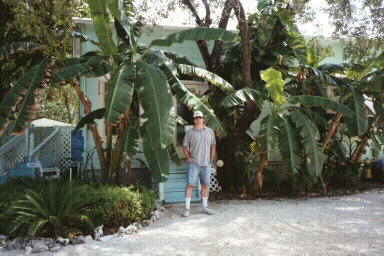 The picture above is one Luke took of me outside our Conch Key "cottage." Drove north to Islamorada, a fishing town (the "leaving Islamorada" sign has a picture of a big tarpon and says "catch you later"), to visit a famous fishing gear shop called World Wide Sportsman (MM 81.5, bayside). I wondered how a Florida town got a Muslim name. But I learned it's pronounced "Eye-la-mor-a-da," and I read that it's from Islas Moradas, "Purple Isles" in Spanish, so-called by the early sailors, supposedly for the qualities of the sunsets there. The store was supposed to be a sight in itself: cavernous, with its own aquarium and a whole fishing boat inside to crawl around on and the lounge of Zane Grey's club moved into the upstairs, and photos of Hemingway and Harry Truman (Grey, Hemingway and Truman are the Keys' holy trinity). I also wanted to buy a nautical map of the Keys there, possibly for framing. Luke talked me into buying him a $20 fishing rod, saying he was determined to catch the big tarpon that lurks around the dock. At the end of the island is a monument built of coral rock in memory of the hundreds who were killed when the 1935 hurricane swept over the islands with a 17-foot sea-surge. The highest elevation on the entire chain is barely 20 feet. Then we drove down to Crane Point Hammock, a little museum of island life and nature, outside Marathon. We walked the nature trail through one of the last stretches of Keys that looks pretty much as it did when Europeans arrived. The total walk was about two miles. We walked slow enough to bear the humidity, and fast enough to stay ahead of the mosquitoes. We saw beautiful zebra butterflies, and out at the end of the trail watched a nurse shark circling in Florida Bay. Golden orb spiders, red and gold, sat in the middle of their thick webs. "Males are small and drab and usually die of exhaustion and starvation shortly after mating," the guide book proclaims. Now, how do they know that? Does someone do autopsies on microscopic spiders to determine cause of death? At the museum I read, again, that the native Calusa Indians left the Keys forever in 1763; but, again, they don't ever say where they went. Stopped for lunch on the way back at Herbie's, an intensely local place with excellent snapper fish fingers, and visited The Shell Man and bought tourist junk. Luke is ambivalent about being a tourist. He has an instinctive dislike for the clownishness of it, but he realizes his mother makes her living off tourists. And he likes junk as much as anyone. Sign of the day: "Open 10 a.m. to 3 p.m., and whenever I'm here." Today we did Key West. It rained all the way down, but the clouds broke up when we got there. Here's another place with real beaches to explore, and it feels even more foreign than Savannah. Key West is international, strongly gay, kitschy as hell -- Bohemian Bahamian. Roosters chase their chickens around the streets and roam the grounds of the city hall. We ate at the Meteor, a good barbecue joint attached to the Green Parrot, at Whitehead and Southard, which is an old-time saloon favored by the locals who avoid the tourist traps on Duval Street. We didn't. We cruised Duval Street from end to end. I haven't heard so much German spoken since college and the galleries put the lie to the myth that gay men always have good taste. It's wonderful, though. Luke loves head shops, which to him are just stores full of cool, exotic stuff. We saw the house where J.J. Audubon stayed, and we visited Mel Fisher's museum to see the incredible treasures he's pulled from the wrecks of the Nuestra Senora de Atocha and other Spanish ships: Gold bars you can hardly lift and gold chains thick enough to tow a car with. We drank Key lime slushies and had our picture taken at the "southernmost point," by a Cuban couple in exchange for us taking the same photo of them with their camera. Even on the tight lots of Key West, a house a mere 10 feet from the sidewalk can be completely hidden by banana and palm trees. Luke has gone native. At 9 p.m., with a big thunderstorm lurking over Marathon, he's out on the dock, with bits of hot dog on his hook, tangling his new fishing line with those of a couple of young guys down with their wives from northern Florida: shirtless, tanned, wearing shorts and water shoes. A patient young guy named Kent showed him how to cast, and Luke managed to catch five fish: mangrove snapper, lane snapper, and a big white grunt. One of the snappers was eight inches long. Sign of the day: In a Key West restaurant: "Hippies use side entrance." And a bumper sticker: "Instead of Being Born Again, Why Not Just Grow Up?" Took a morning swim with Luke, then came back to the cabin, showered, and drove up to Lower Matecumbe Key to visit the school of tarpon that live around the dock at Robbie's Marina (MM 77.5), almost under Lignumvitae Channel Bridge. For $2 you can buy a bucket of herring to toss in the water to feed them. Some of the tarpon are as long, and almost as heavy, as me. They're also fast; if you throw the bait fish out as far as you can, the ones at the dock will dash out 30 feet with a flick of the tail in a second. And their jaws slam shut with a vacuum thump that you can feel as well as hear. Then we walked next door for a full lunch at the Hungry Tarpon (above, with Luke posing for scale). This is one of the cheap, good, totally local places, and it was my favorite spot to eat in the Keys, though we never made it to their famed "grits 'n' grunts" seafood breakfast for early-rising fishermen. 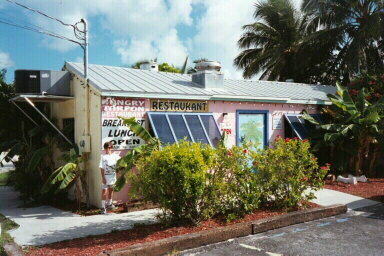 The Hungry Tarpon (official address "somewhere on A1A") is an old-time diner shack, with a few tables but mostly counter seating. It has year-round Christmas lights, and the grill is right across the counter, so you watch your food cooking. The bulk of the space above it is taken up by aluminum ventilation shafts. They're plastered over with bumper stickers. "Women: Can't Live Without 'em, Can't Shoot 'em," "Husbands Are Proof That Women Can Take a Joke," "Don't Steal, the Government Hates Competition." A waitress from another place in town roller-bladed in for a Red Stripe. Keys people, whatever their vices, lack the vices I am accustomed to from home. There are no 13-year-olds walking pit bulls, no cars driving slowly, thudding out rap music full of The Threat, no Christ-encrusted hypocrites. At Marathon marinas, every day at sunset, people stand out on their decks or docks and blow conch horns, like some ancient rustic ritual. I'm known around Conch Key as "Luke's dad," as he is everywhere -- in the pool, on the beach, on the dock, entertaining younger kids and showing them how to catch lizards and crabs and trying to be helpful to adults. Sign of the day: Bumper sticker from the Hungry Tarpon: "You Gotta Be Tough if You're Gonna Be Stupid." A leisurely morning. 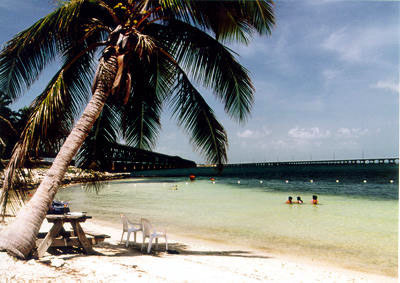 We packed some gear and drove down to Bahia Honda (above) for some snorkeling. Had a sting ray for a companion. But the very strong currents kept Luke frustrated. Our spot there is at the southern tip of the key, near the old bridge. Because it was too narrow for a road, when they converted it from railbed to highway they simply reinfoced the superstructure and paved over the top of it, which gives it a much different look than the other bridges. Came back, cooked sausages, and spent the late afternoon in and around our pool. I drove into Marathon for supplies and stopped in to the Internet cafe for a quick chat with Kat. Luke spent the evening fishing off the dock. The clouds boil up off the sea. In the afternoon, they huddle like linebackers and then rush the shore. Tonight, though, the winds kept them off. You can see a whole rainstorm as you cross the bridges, from the white cream froth on top, to the slate flat bottom and the dragging sheet of rain beneath it. Like a living thing, floating, a man-o-war of the skies. Luke saw a shooting star (Perseid) from the dock. I had forgotten how poor Florida is for stargazing. I had hopes, being down around lattitude 25 or so, to see stars I had known of all my life, but never laid eyes on. But clouds obscure most of the sky at night. I did catch a glimpse, though, of the Scorpion, riding high and clear of the horizon (unlike at home where it barely clears the trees) and a straggle of stars below it that might have been part of the Wolf or the Centaur. Sign of the day: The billboard for Whispering Pines trailer park near Marathon has seen better days, and one of the letters had dropped out entirely and hangs inverted by a single staple. But Luke and I think it will be a much more interesting address once it becomes "Whispering Pies." Our last full day in the Keys. We took a ride up to see Theater of the Sea, just for a lark, but it turned out to be way too expensive, so we came back, buying a Key lime pie along the way, and spent the afternoon goofing around in the pool. Then we watched Luke's fishing buddies clean their lobster catch. They go out every day and return with a dozen or so Florida lobsters, which have no claws. You only eat the tail. It hides by day in the crevices of reefs and is said to take some skill to catch: you have to go down in scuba gear and "tickle" them out. Later we returned to Key West, to begin the homeward leg properly from Mile Marker 0 and to see the stuff we missed on the first trip and to cross my favorite bridges for the last time in sunlight. We had margaritas at Jimmy Buffett's bar, ducked into Sloppy Joes while I explained it a bit to Luke, and explored the old cemetery. As the sun began to set we followed the citizens out to Mallory Park, on the waterfront, where the daily sunset is a "happening," complete with artists, performers, music (above). A mighty galleon of cloud obscured the sun, but it was an awesome sight anyhow. 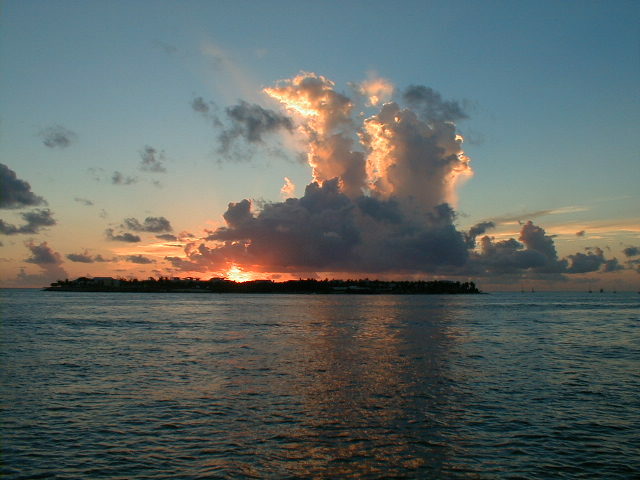 Then we returned to Conch Key, and got back well after dark. Luke went fishing. I bought a European-style "CR" nation sticker for my car. 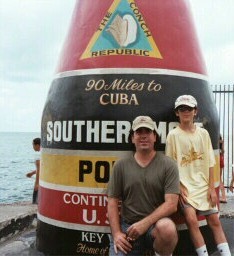 For "Conch Republic." The Keys seceeded again, in 1982, but nobody noticed. It seems President Nancy Reagan sent the U.S. Boarder Patrol down to set up a military-style roadblock on the Overseas Highway and search all northbound traffic for illegal aliens and drugs. The traffic jam was a nightmare still remembered. The "Conch Republic" declared its independence, declared war on the United States, immediately surrendered, and applied for foreign aid. 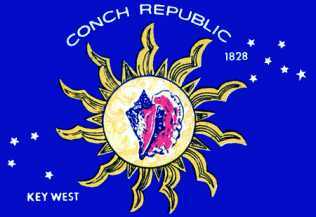 "Conch Republic" flags (below) fly everywhere. I suppose Californians don't understand the East Coast fixation with seeing the sun set into the sea. They might feel the same fascination for seeing the sun rise out of it. I remember walking on the beach at sunrise, enveloped in dark fog that grew lighter, through shades of gray till it was almost pure white, thick as smoke, like standing in a goddess' aura, then the disc of the sun appeared and in less than a minute it was gone, burned away, and day had begun. But we never get to see sunset over the water. There is exactly one place, way down at the tip of that dangling member of New Jersey, that has the Atlantic on one side and the wide Delaware Bay on the other. The bay side is so much open water that you can actually watch the sun set into the "sea." But the spot has been taken over by flag fetishists, so instead of just watching the sun go down you have to endure a moment of silence (and you better look like you're praying hard), a scratchy recording of Kate Smith's "God Bless America," a flag-lowering ceremony, "taps," and a tinny over-brassed recording of the Star Spangled Banner. I think the whole thing is a set-up by the very numerous New Jersey mosquito population, to get people to stand still as long as possible so the blood-suckers can swarm them. Sign of the day: In the Key West cemetery, the tombstone of someone who died in 1979 is engraved with name, dates, and "I Told You I Was Sick". Finished packing and cleaning up, stuffed the cooler with ice, then checked out and left Conch Key. Key Largo, which seemed quaint and folksy when we first saw it, coming down, seemed crass and overcrowded on the way home. Across the drawbridge at the end of Lake Surprise, and we were back into real place and real time. Time really rests more lightly on the Keys. I've wondered why being back in Florida for the first time in 25 years didn't jolt me with memories or flood me with the kind of joy I felt in being here as a child. But being the adult, the budgeter, the driver, the guardian, probably blocks some of those doors to me now. I only met my childhood again once I realized it was our last night to swim in a pool under palm trees. That brought back a sadness I remembered: of so much I wanted to do, or to do again, of people and places to be boxed up and put on the shelf till "next time," which seems forever. The sorrow is the only memory that crosses over. Drove west from Florida City into the Everglades park, and took a walk down a nature trail. Saw one gator and one turtle, but most of the wildlife, unlike the humans, was smart enough to keep still in shady spots during the heat of the afternoon. Backtracked and drove through more Miami traffic before lighting out across the state on Route 41 (Tamiami Trail), past Miccosukee Indian villages and cypress swamps and miles and miles of grass river. Luke slept. I watched a big dark stormcloud that filled half the sky and flashed lightning every few seconds. It was beautiful and stark, but then I had to drive through pounding rain all the way into Naples. Frankly, an hour-long hike through the Everglades was fascinating, but not really exciting. But during a break in the evening showers in Naples, we walked across the highway from the Holiday Inn and strolled through the Naples Beach golf course and saw flocks of ibis in flight and feeding, several species of ducks of all ages, elaborate banyans and strangler figs, and a couple of anhingas, one working a pond, the other trying to dry its wings. It's hard for me not to loathe Naples. It's everything I hate about what development did to Chester County; this could be its capital. New, privileged, lacking class, it has no building older than 1919; it had 5,000 people in 1950 and 25,000 today. It vies for the title "Golf Capital of the World," and may have more millionaires per capita than any place in Florida. Sign of the day: "Ugly Florida beach towels, $4.98." 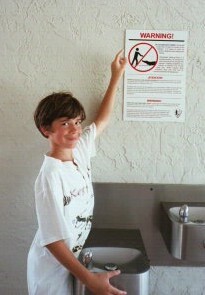 Below, Luke enjoys the "do not feed the alligators" warning at Everglades National Park. We made good time on I-75, so we got to our next stop, Valdosta, Ga., much earlier than I expected. Valdosta made us feel sad. People were very friendly, but there was nothing going on, and two of every three storefronts stood vacant. There was a monument to "our Confederate dead," and a courthouse that looked promising from the outside, but was all drop ceiling and cheap plaster inside. All the phone book lists under "attractions" is the nondescript local college and a Christian music festival. We even drove 40 miles west, to Thomasville, looking for an old plantation or something to explore, but there was nothing to see except red clay, pine trees, trailers, a dead armadillo, and beautiful arrangements of Spanish moss. So we came back and ate dinner at Hooters for the first time ever. Kat says not to worry about Valdosta. "It's always been dead. Some Southern towns are just like that. They go from dead, to another version of dead. But I've noticed, it's nationwide." Unaccountably, to me, the town seems to have a numerous Indian population and supports a large video store with windows full of Bollywood posters. Refrigerator magnet of the day: We saw this at a rest stop on the Florida leg of I-75. Above a picture of an alligator: "send some more tourists (the last ones were delicious)." Followed Kat's driving instructions to Marietta, which involved a trip on the bypass around Atlanta. To those familiar with Philadelphia, it has the size and degree of difficulty of the Schuylkill Expressway, but the resemblance ends there. A drive around Atlanta makes the Surekill look like Lover's Lane. I had read and heard the warnings. And secretly I thought, "surely, this is hyperbole." It's not. The concept of "space" is more suited to the NFL backfield than to defensive driving. Lane four has a minimum speed of 90 and even then you're likely to get blown out. The first lane is a mess of manic mergers and impulse exiters. It's also where first-timers shiver and clutch the steering wheel in the throes of nervous breakdowns. The second lane is worse, because trucks are limited to the two inner lanes, so this is their passing lane, and they're as reckless and aggressive as the cars. Lane three would seem a safe choice, but there you're dealing with three-lane pinballers zooming across your path from both directions. I played run-and-gun in the traffic for a few miles. I fell in with a courier van from the airport that was going about 90 and weaved in and out with him. At one point I heard what sounds like the world's biggest 18-wheeler bearing down on me, but I couldn't see anything in the mirrors; then I realized it was a damn 747 going right over me into Hartsfield. I did see one Ga. Patrol car, but fortunately I was only going about 80 at the time. Amusing that at the exit where we left the highway, the gas station was called RaceTrac. Once we were off the highway, we explored the Kat Trail of History. The first landmark was the BIG CHICKEN! 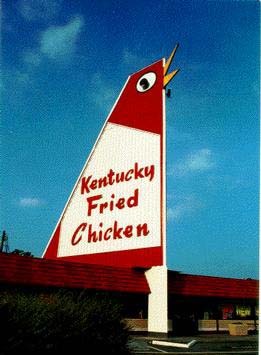 (left), a circa 1963 KFC franchise with an enormous deranged-looking chicken built into the roof, that opens its beak and rolls its eyes. Marietta, Katrina's hometown, is a quaint little burgh, the size of Lancaster but it feels more like West Chester. The old trees on the square are beautiful. We had coffee from a funky little place and ate lunch at Hemingway's. We visited the tourist center and bought a Beanie Baby version of the BIG CHICKEN! from some historical women who managed to disguise their disgust with the fact that, with all the charm and history available in this town, here come two more tourists who want a souvenier of a glorified billboard. We visited a herb shop in a tiny box off the parking lot behind the visitor's center, on Luke's sugestion. It's run by two very nice young women, but they hardly get any business. Southern towns hide their banks very well. In Pennsylvania, a town square like that would have six or seven banks all around it. I like it better without them, but we had to wander to find an ATM machine. And what's with the rain? It only rains when the sun is shining? In Pennsylvania, the rain knows how to behave itself. Then we drove out toward the Kennesaw Mountain battlefield, again following Kat's directions. It was a hot, overcast day, but in spite of that, we did the trail climb. This time, the Yankees made it to the summit, though not without much shedding of sweat. We saw a chipmunk and Luke caught four different types of lizards, including one with a blue tail that he thinks was a skink. The view was spectacular, in spite of thick haze. Back at the hotel, Kat's friend James arrived with boxes of stuff she had set aside to give me, or for me to take home for her when she arrives: clothes, shoes, books, swords, stuffed animals, Confederate flags, all the usual things. We had dinner with him at the Cracker Barrel beside the hotel. Back to the Atlanta beltway. I'd expect it to be calmer on a Saturday morning, but it was still a roller derby on Ritalin. I started by going 70 (the actual posted speed limit, by the way, is 55) and felt like I was standing still. The only thing I passed was the Taggart's Driving School car. So I hit the gas and joined the race till we got to the Stone Mountain exit. The Stone Mountain carving is majestic, but the rock itself is so much bigger than I had expected. It's a wonder of the world. Luke was hatching schemes to get the carving finished; he even thought of doing it himself. But after paying $7 just to get into the park, I didn't feel like paying again to enter the heritage site or take the cable car up the mountain. We found a spot off to the northwest that had been quarried at some point. The granite sloped down in a flat curve into a pine woods pond. Luke explored that, while I lay on the rock and looked up at the mountain and the sky. Then we headed to Atlanta. We parked on Pryor Street and walked through the Underground, a subterranean shopping district, and the Coca-Cola building, which felt like a shabby cult temple. It's the most integrated city I've been in. There are white and black people everywhere, yet I never felt conscious of being in a "white part of town" or a "black part of town." From the homeless in the park to the diners in the hotel-top restaurant. Then we walked up to the Westin Peachtree (above) and checked in to room 6804, a good 700 feet above the sidewalk. One wall was a great curved window looking out over the city, taking in five or so skyscrapers as big as this one, Kennesaw Mountain, and off to the left the CNN building and Olympic park. Late in the day we watched a thunderstorm move over the city from the west, with heavy rain and lightning strikes. We were so high up the raindrops were blowing up and around as much as streaking down. Looking out at the city I could see what Kat was telling me about Atlanta being more like several connected cities. There was the city center, right in front of us, but then a couple miles northeast was another clump of skyscrapers that looked like a separate city, but was too near to really be one. Another cluster stood just to the left of that. Even coming in, when I had the chance to look up from the driving chaos, I saw individual skyscrapers standing atop wooded hills, like Rhineland castles. We went out later to try to find some authentic Southern cooking (especially with peaches), but the place I picked turned out to be more nouveau veggie, though I did eat grits there for the first time in my life (lumpy, wet, tasteless). 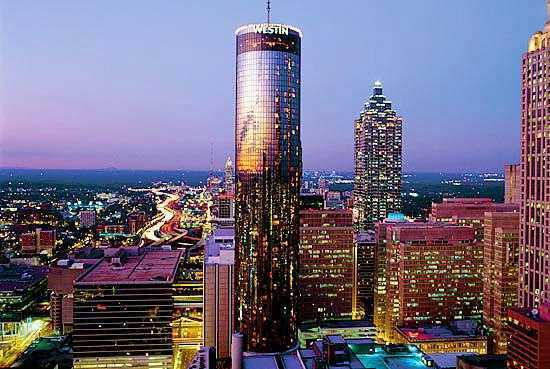 Back at the hotel, we explored the pool and the weight room, then rode the outside elevator up to the top floor (83rd) and back down, and turned in for the night with all the lights of Atlanta shining up from below. The pictures below are two I took in our hotel room, the morning we left. One features a sleeping Luke still in bed. Left the Westin Peachtree, downtown Atlanta, at 8:04 a.m. Eleven hours and 40 minutes later, arrived in front of 536 E. King St., 810 miles north. On Luke's suggestion, we try to pass the time by playing 20 questions, but it always breaks down into legalistic arguments: is "shell" animal or mineral? We made four very brief stops; two for gas, one for lunch, and one for Luke to pee in the underbrush outside Chambersburg. The best part of the day was getting into the steep hills of eastern Tennessee soon after sunrise, early enough to see why they called these the Smoky Mountains. � August 23, 2002 Douglas Harper Moe: "Say, what's a good word for scrutiny?" Shemp: "uh ... SCRUTINY!"